Lexengine: Conflict in Sri Lanka: How it grew and what was the role of India? Conflict in Sri Lanka: How it grew and what was the role of India? The historical facts also play an important role for the emergence of the conflict in Sri Lanka. 5 BC – Indo – Aryan migrants from Northern India settle on the island known as Ceylon; the Sinhalese emerge as the most powerful of the clans. 3 BC – Beginning of Tamil migration from India. 1815 - The British become first European power to win control over the whole island, known as Ceylon. Start bringing in Tamil labourers from southern India to work tea, coffee and coconut plantations. February 4th 1948 - Ceylon gains full independence. 1956 - Solomon Bandaranaike starts Sinhalese nationalism. Sinhala is declared official language. More than 100 Tamils killed in widespread violence after Tamil parliamentarians protest at new laws. Prime Minister passed the "Sinhala Only Act", an Act which replaced English with Sinhala as the only official language of the country. This was seen as a deliberate attempt to discourage the Sri Lankan Tamils from working in the Ceylon Civil Service and other public services. TheTamil speaking minorities of the Ceylon (Sri Lankan Tamils, Indian Tamils and Sri Lankan Moors) viewed the Act as linguistic, cultural and economic discrimination against them. 1960s - documents relating to a separate Tamil state of 'Tamil Eelam' began to circulate. At this time, Anton Balasingham, an employee of the British High Commission in Colombo, began to participate in separatist activities. He later migrated to Britain, where he would become the chief theoretician of the LTTE. In the late 1960s, several Tamil youth, among them Velupillai Prabhakaran also became involved in these activities. They carried out several hit-and-run operations against pro-government Tamil politicians, Sri Lanka Police and civil administration. 1970s - The infamous Policy of standardization an act of Institutional racism was initiated. Under this policy, University admissions were standardized to correct the disproportionately higher number of Sri Lankan Tamil students entering universities. Officially the policy was meant to discriminate in favour of students from rural areas but in reality the policy discriminated against Sri Lankan Tamil students who were in effect required gain more marks than Sinhalese students to gain admission to universities. For instance, The qualifying mark for admission to the medical faculties was 250 (out of 400) for Tamil students, whereas it was only 229 for the Sinhalese. As a result, the number of Sri Lankan Tamil students entering universities fell dramatically. The policy was abandoned in 1977. 1972 - Section 29(c) of the Soulbury constitution of 1946 provided the basis for independence in 1948 and prohibited parliament from introducing discriminatory legislation. But laws that discriminated against Tamils were nonetheless introduced and implemented. In any case this constitutional safeguard was abolished in the new constitution of 1972. 1978 - In the new Constitution, precedence was given to the religion of the Sinhalese Buddhists. 1972: Formation of Tamil New Tigers (TNT) by the Tamil Tiger leader Velupillai Prabhakaran After four years TNT becomes the Liberation Tigers of Tamil Eelam (LTTE). This was formed around an ideology which looked back to the 1st Millennium Chola Empire – the Tiger was the emblem of that empire. 1983:A fifteen-man Sri Lankan Army patrol (Four Four Bravo) was deployed in the Jaffna Peninsula on July 23, 1983. The patrol was ambushed and thirteen of its members were killed by the LTTE. This incident sparked the Black July riots and is considered to be the start of the Sri Lankan Civil War. 1980s: India became involved in the conflict in the 1980s for a number of reasons, including its leaders' desire to project India as the regional power in the area and worries about India's own Tamils seeking independence. The latter was particularly strong in the Indian state of Tamil Nadu, where ethnic kinship led to strong support for independence for Sri Lankan Tamils. Throughout the conflict, the Indian central and state governments have supported both sides in different ways. Beginning in August 1983, until May 1987, the Indian government, through its intelligence agency Research and Analysis Wing (RAW), provided arms, training and monetary support to 6 Sri Lankan Tamil militant groups including LTTE. LTTE's rise is widely attributed to the initial backing it received from RAW. It is believed that by supporting different militant groups, the Indian government hoped to keep the Tamil independence movement divided and be able to exert overt control over it. 8 July 1985: First attempt at peace talks between the government and the LTTE in Bhutan fails. 29 July 1987: Negotiations were held, and the Indo-Sri Lanka Peace Accord was signed on 29 July 1987, by Indian Prime Minister Rajiv Gandhi and Sri Lankan President Jayewardene. Under this accord, the Sri Lankan Government made a number of concessions to Tamil demands, including devolution of power to the provinces, a merger—subject to later referendum—of the Northern and the Eastern provinces into thesingle province, and official status for the Tamil language (this was enacted as the 13th Amendment to the Constitution of Sri Lanka). India agreed to establish order in the North and East through a force dubbed the Indian Peace Keeping Force (IPKF), and to cease assisting Tamil insurgents. Militant groups including the LTTE, although initially reluctant, agreed to surrender their arms to the IPKF, which initially oversaw a cease-fire and a modest disarmament of the militant groups. The signing of the Indo-Lanka Accord, so soon after JR Jayawardene's declaration that he would fight the Indians to the last bullet, led to unrest in south. While most Tamil militant groups laid down their weapons and agreed to seek a peaceful solution to the conflict, the LTTE refused to disarm its fighters. Simultaneously, nationalist sentiment led many Sinhalese to oppose the continued Indian presence in Sri Lanka. These led to the Sri Lankan government's call for India to quit the island, and they allegedly entered into a secret deal with the LTTE that culminated in a ceasefire. But the LTTE and IPKF continued to have frequent hostilities. 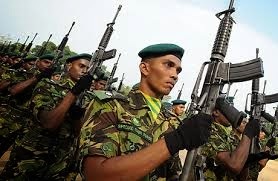 April 1989 - the Ranasinghe Premadasa government ordered the Sri Lanka Army to clandestinely hand over arms consignments to the LTTE to fight the IPKF and its proxy Tamil National Army (TNA). Although casualties among the IPKF mounted, and calls for the withdrawal of the IPKF grew, Gandhi refused to remove the IPKF from Sri Lanka. However, following his defeat in Indian parliamentary elections in December 1989, the new prime Minister V. P. Singh ordered the withdrawal of the IPKF.